Honeywell’s Voyager™ 1202g-bf single-line laser scanner incorporates breakthrough battery-free technology, offering the freedom of Bluetooth® wireless technology without the maintenance hassle or long recharge time associated with traditional batteries. Like all other Voyager scanners, the 1202g-bf delivers aggressive linear bar code scanning performance—even on poor quality or damaged bar codes. An integrated Bluetooth Class 2 radio grants users complete freedom of movement up to 10 meters (33 feet) from the base in a typical work environment. For added convenience, a paging system on the base activates auditory signals that help to locate a misplaced scanner. 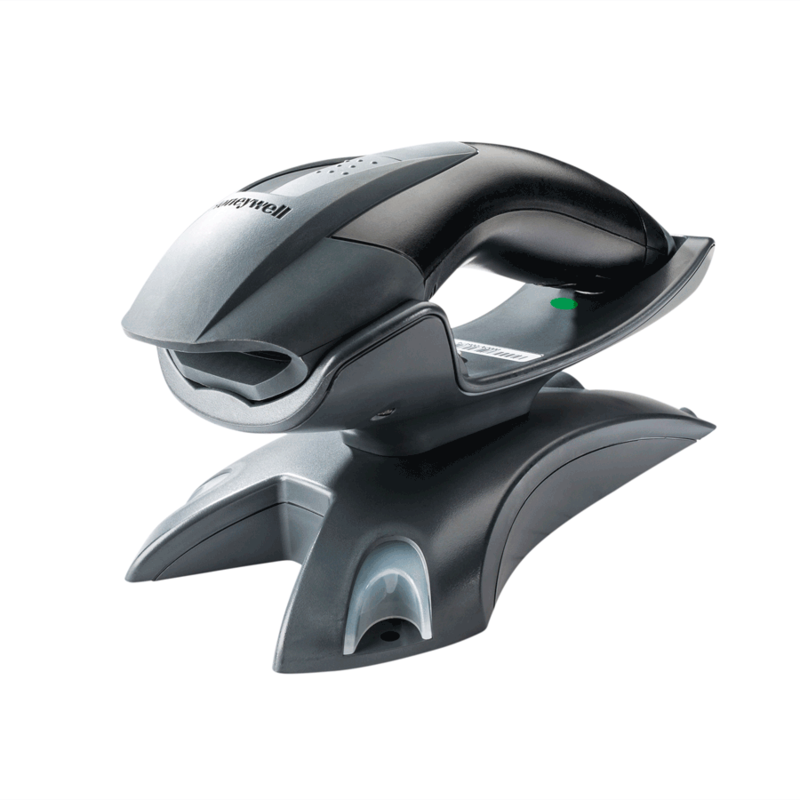 By eliminating the trip-hazard of tethered cables, the 1202g-bf can make for a safer and more productive work environment. Battery-Free Wireless Technology: Fully charges in less than 35 seconds with a wall power adapter, and provides short-term power for at least 100 wireless scans.1 By eliminating the battery, a common maintenance headache is removed, and the scanner is lighter and more environmentally friendly. Bluetooth® Wireless Technology: Grants wireless freedom of movement up to 10 meters (33 feet) from the base, depending on user environment. Reliable Bar Code Reading: Increase throughput and reduce the potential for hand-keyed errors by quickly scanning a variety of 1D bar codes, including those that are damaged or poor quality. Automatic Interface Configuration: Supports all popular interfaces in one device, replacing the time-consuming process of scanning programming bar codes with automatic interface detection and configuration. Paging Functionality: Simply press the button on the base to locate your lost scanner; Voyager responds with a series of beeps and blinking lights on its indicator panel. Decode Capabilities: Reads standard 1D and GS1 DataBar symbologies.